Halifax is such a charming city by the sea offering so much from old fishing villages to a happening downtown. 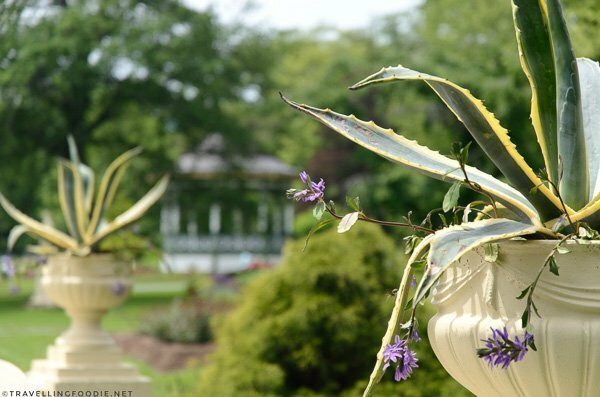 There is something for everyone here: from history buffs exploring historic sites and museums, art buffs admiring works at the largest art museum in Atlantic Canada, to foodies eating their way to some of the best seafood in Canada, and casual travellers enjoying the sights and landmarks. 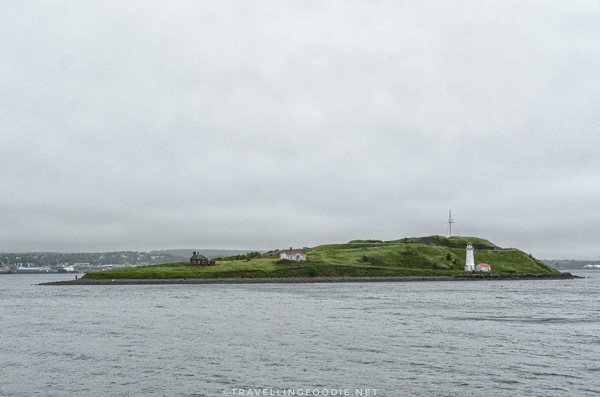 I had the pleasure of exploring Halifax on a press trip with Discover Halifax and Tourism Nova Scotia. This was officially my first time being in Halifax. I’ve been here in 2012 but only for a few hours as part of the New England Cruise so I don’t really count it. In the 4 days I was here, it was a whirlwind of eating and touring the city. I loved the fact that Halifax is such a walkable city. 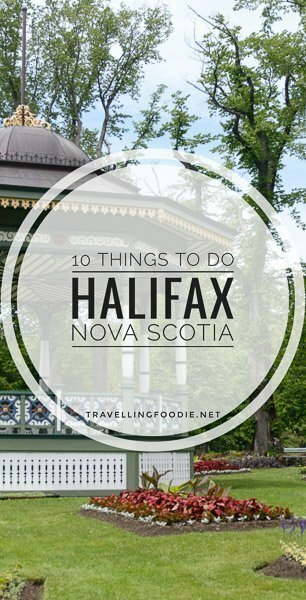 I walked everywhere in this trip to visit some of the best attractions in Halifax. 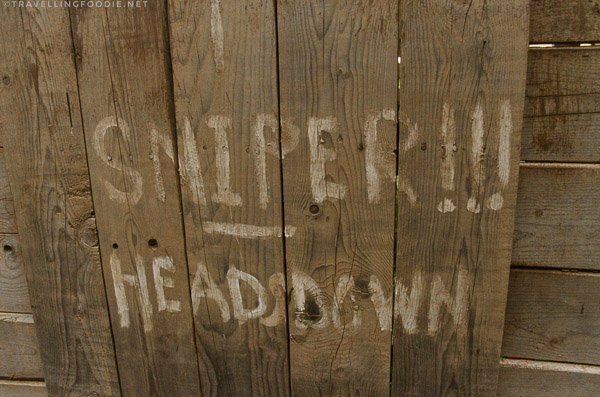 You’ll see from the map at the end of the post where each of the place is. If you want to see more travel photos, be sure to follow me on my Travel Instagram, @JourneyTraveler. 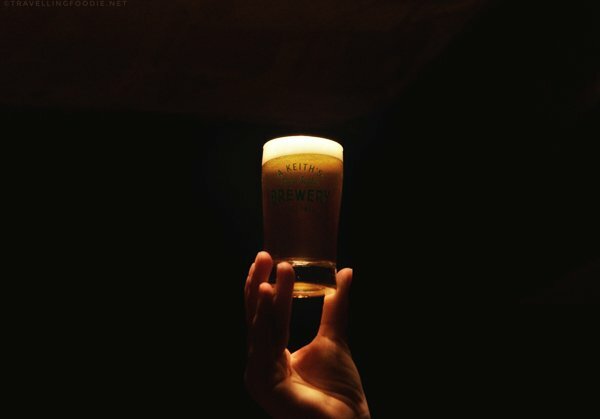 Alexander Keith’s is among the oldest commercial breweries in North America, founded by Alexander Ketih in 1817. This historic brewery was originally built in 1820, and began brewing IPA in 1822. The award winning historical tour is very different from most brewery tours. 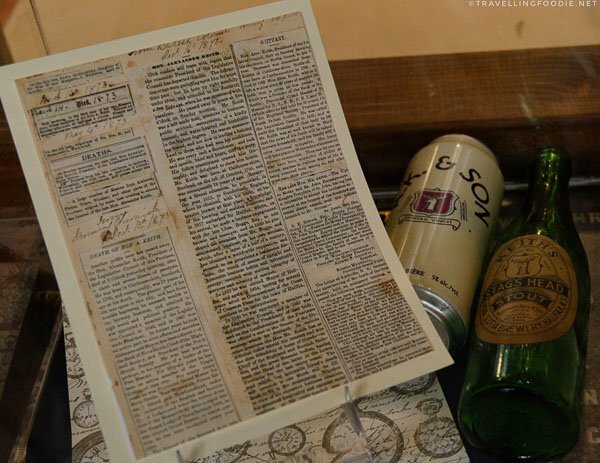 It doesn’t just go over the beer brewing process, but also tells a bit of Alexander Keith’s story and some history as well. Did you know? 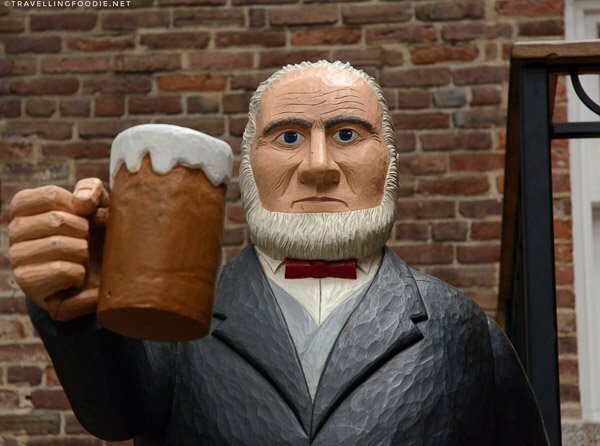 Aside from being Nova Scotia’s first certified brewmaster, Alexander Keith was also a three-time mayor of Halifax. 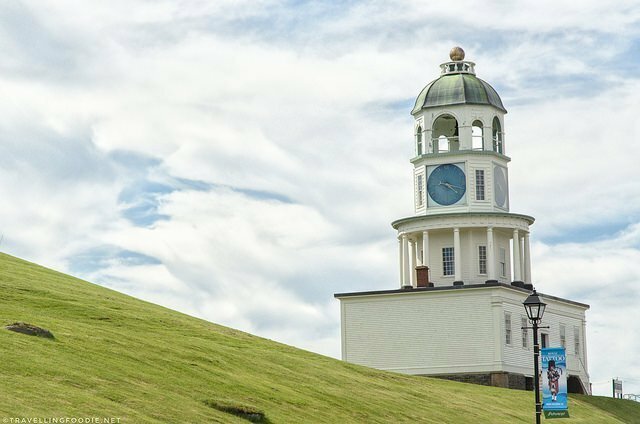 During the tour, you’ll find historical artifacts related to Alexander Keith’s and Halifax, including the popular Halifax Explosion. The brewery was spared from damage during the explosion, with the exception of a crack in the stained glass window in Keith’s Hall. 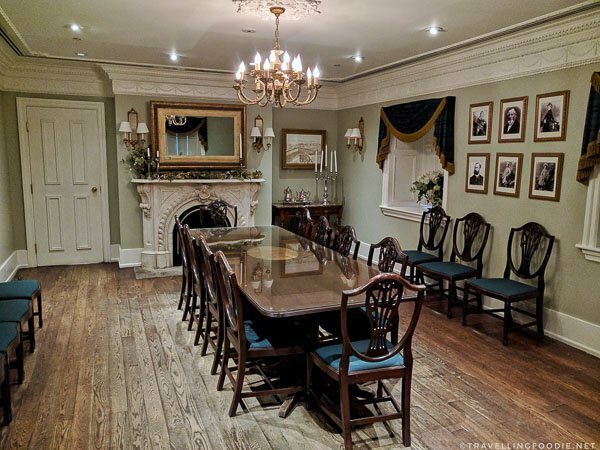 They even made a replica of Alexander Keith’s dining room. Of course, you’ll also get to sample some beer! It starts off with a welcome IPA sample at the beginning of the tour. After the dining room, you’re brought to a storage room where you’ll find all the ingredients that are used in at least one beer. You’ll get to sample a rotating beer, in my case was the Lunenburg Coffee and Cacao Stout. At the end of the tour, you get to witness the historic “hidden pub”, The Stags Head Inn, where you get to sample 3 more beers! This brewery produces beer that are only available in Halifax, so it’s great that you get a chance to try them! The Art Gallery of Nova Scotia is Atlantic Canada’s largest art museum with over 17,000 works in the permanent collection plus touring exhibitions. There are two heritage buildings, built in 1868, as part of the art gallery, the North and South wings. Both buildings and the lower level, which connects the two, all have art exhibits so you’re immersed in art every step of the way. The North has three levels including the permanent collection. There’s an interesting exhibit, Centuries of Silence: The Discovery of the Salzinnes Antiphonal, which is a mid-sixteenth century choir manuscript. In the exhibit, you’ll get to learn how they translate the antiphonal to music, and even listen to the music. My favourite art work from the gallery is “Island in the Ice” by Tom Forrestall. The Discovery Centre is Nova Scotia’s only hands-on science centre with four floors of interactive learning about science, technology, engineering and more. It also houses Atlantic Canada’s only immersive dome theatre. First Floor has the featured exhibit, Tyrannosaurs: Meet The Family. 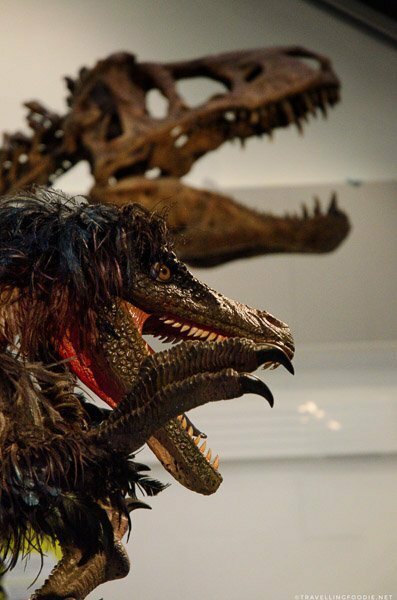 Created and developed from the Australian Museum, Tyrannosaurs: Meet The Family is at the Discovery Centre until August 25, 2017 on its premiere tour to North America. 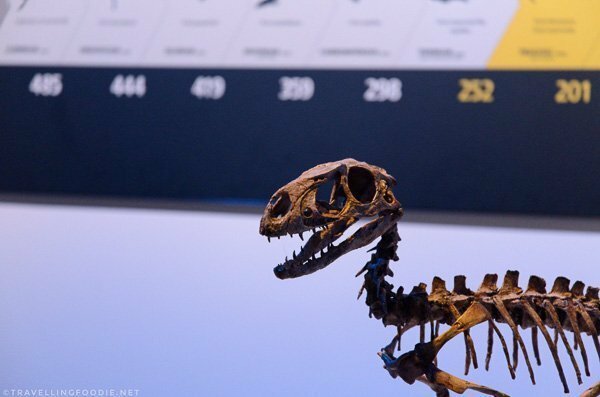 It’s a great way to learn about everyone’s favourite dinosaur, T-rex, as the exhibit features life-sized dinosaur fossils, discoveries, and historical links between birds and dinosaurs. Second Floor has the fully immersive Dome Theatre that shows the wonders of the world and full dome films. Third Floor showcases a three themed gallery of flight, health and energy with interactive and hands-on activities to stimulate the brain. Fourth Floor is the kids-only section, The RBC Someday Street, designed to teach kids on how cities function in a hands-on way. For example, in the Family Farm, kids can milk a cow, plant a garden and ride a tractor. The Canadian Museum of Immigration at Pier 21 takes you back in time when one million immigrants between 1928 and 1971 moved to start a new life in Canada. The museum features over 400 years of immigration to Canada. Did you know? 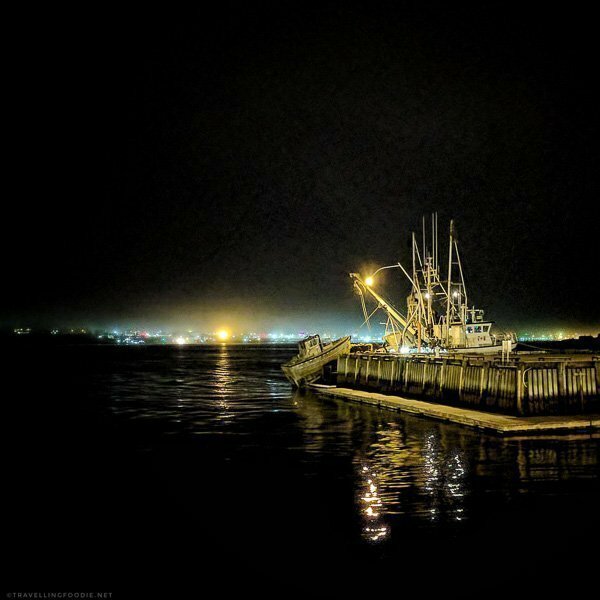 Pier 21 is Canada’s last standing ocean immigration terminal. When you enter, you’ll find the Ralph and Rose Chiodo Gallery which houses temporary exhibitions related to Canadian immigration. 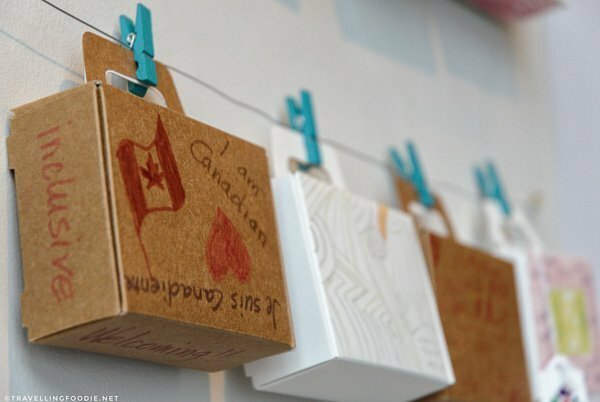 When I went, Canada: Day 1 exhibit, running until November 12, 2017, was featured as the museum’s Canada 150 project. The exhibit brings Day 1 experiences of immigrants across 150 years. 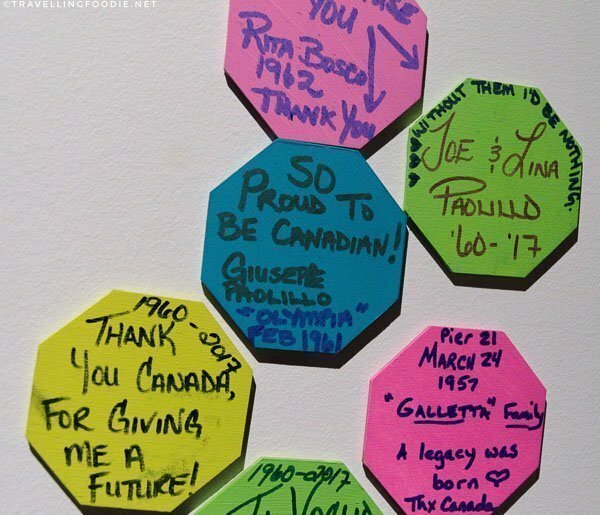 What I enjoyed most about the exhibit are the hand-written notes made by immigrants about Canada. 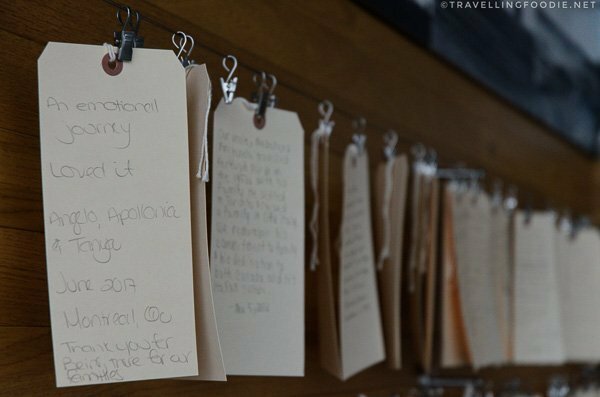 In the exhibit, there’s also the Mini Suitcase Project in which visitors personalized and packed their suitcases with objects that they would take. The museum has a view of the Georges Island. On the second floor, you’ll find the Rudolph P. Bratty Hall which lets you experience what it was like to immigrate through Pier 21 from the boats they rode to migrate, the trunks they brought, the immigration terminal and the train they took to travel within Canada. I highly recommend the tour as you’ll get more insights as some of the volunteer guides are even people who immigrated thru Pier 21! What’s also amazing is you get to witness the exact spot where the immigrants first stepped into Canada. 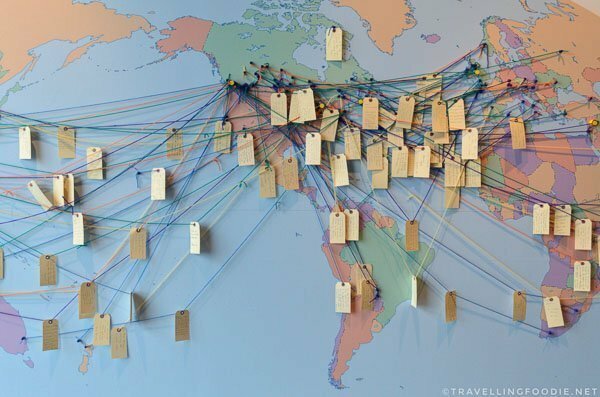 It’s the Gateway section, and they have included replica of the original trunk tags where people can write their stories of immigration. On the same area is the Andrea & Charles Bronfman Theatre which shows their original film, in Canada. The film features personal stories and experience from immigrants from all over the world in themes of Journey, Arrival and Belonging. I highly recommend you to watch it as tt makes you really appreciate being in Canada. It also times well with the tour – by the time this ends, the tour is about to start. Grape Escapes Nova Scotia Wine Tours provides an escape to explore Nova Scotia’s wine country. Though most are wine tours, there’s also the Good Cheer Trail Tour which is what I joined. It’s a very unique tour that goes thru four types of alcohol: wine, beer, cider and spirits. We were picked up at 9:45am at the Marriott Harbourfront by our tour guide, Max, and off we went. Max is very knowledgeable about the industry and the city – it also helps that he studied History in University. He kept us informed and entertained throughout the one hour ride to Annapolis Valley. One of the most interesting things I learned from Max: The climate of the Annapolis Valley is a beautiful climate for making, particularly, white wine and sparkling wine. Nova Scotia has almost the exact same climate as Champagne, France. So Nova Scotia has become renowned for their sparkling wine, winning awards and beating traditional champagnes in competitions. The wine industry is fastly growing as well. 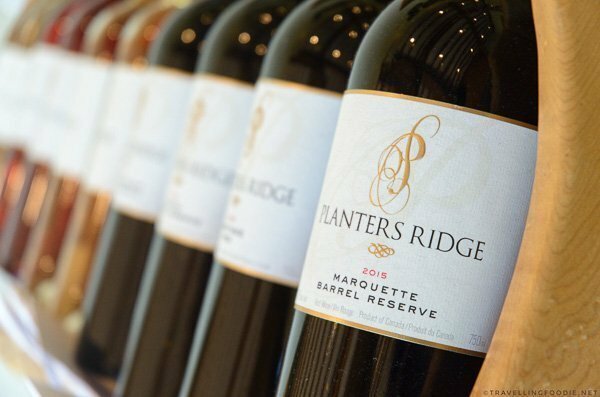 In 1993, there were only 2 wineries, but now there is an upwards of 21. 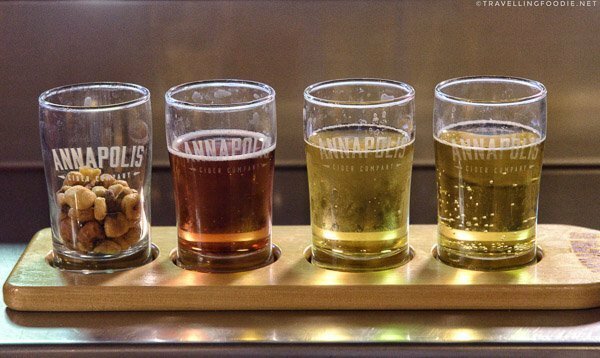 First stop is the Annapolis Cider Company, opened in 2016 by husband and wife team: winemaker Gina Haverstock and apple researcher Sean Myles. We got a tour of the facility as well as sample their three types of cider: Regular, Crisp & Dry, and Sangria. Stirling Fruit Farms provide their apples. Cider Facts: 100,000 apples are required to fill their fermentation tanks, and 10 apples are in each of their bottles of cider. 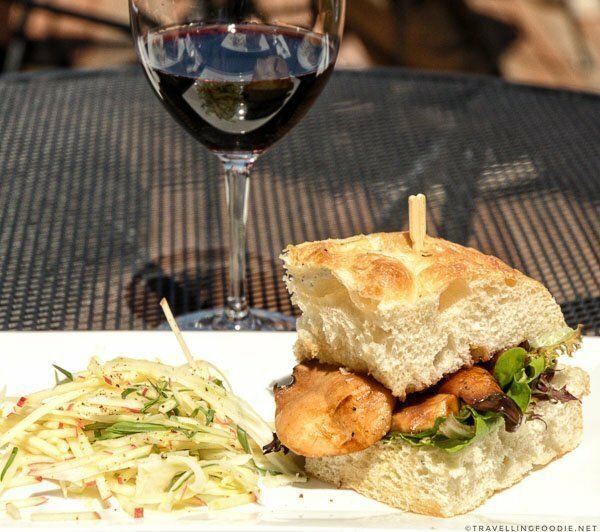 Next stop is for some wine and lunch at Planters Ridge Winery, housed in a renovated 150 year-old historical timber frame barn. The vineyard on-site is 7.5 acres, but they have another vineyard that is 10 acres. All the maintenance in the vineyard is done by manual labor by hand including picking and lawn mowing. The winery produces around 3,000 cases a year (36,000 bottles). We got to sample four types of wine: Tidal Bay, Riesling, Rose and Red. And got a tour of the facility. One of the highlights in this tour is retail and hospitality manager, Janine, who explains things like a stand-up comic and will remind you of a certain character from The Big Bang Theory. We also had our lunch here where we got a choice of ham or mushroom sandwich and a glass of wine of our choice. 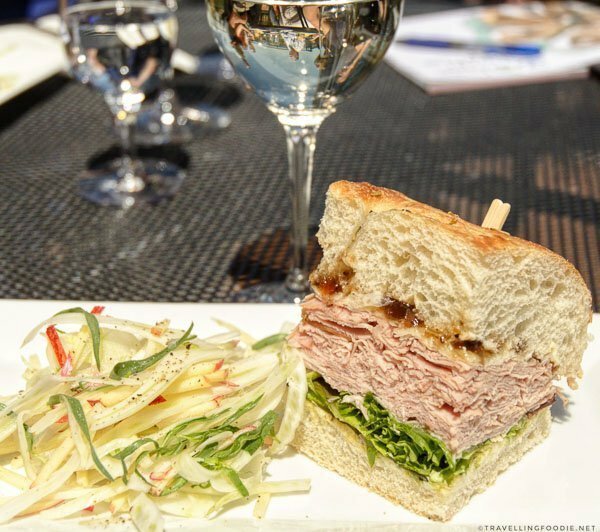 The sandwiches were supplied by Chef Stephane Levac of Frais Catering. I got the ham sandwich with a glass of Tidal Bay. The ham sandwich was very delicious with its fresh bread and juicy flavourful ham. It went very well with the apple slaw. 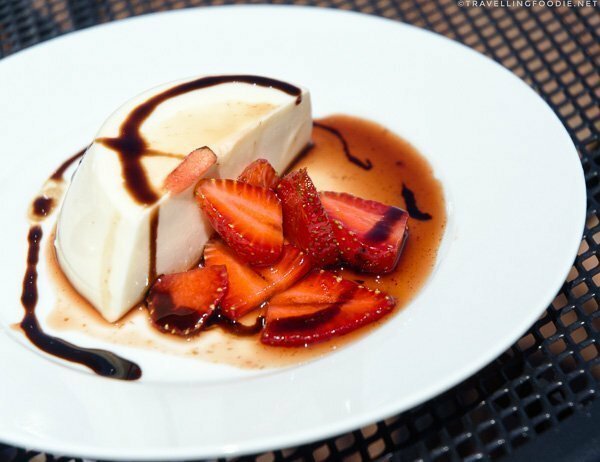 We had the strawberry panna cotta for dessert. Our third stop was the Wayfarers’ Ale Society for some beer. 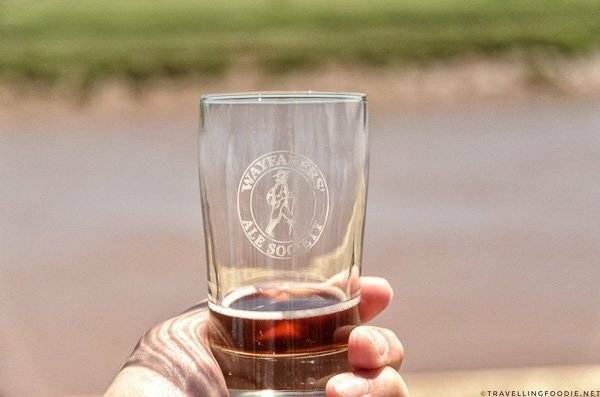 Wayfarers’ Ale Society was created in 2012 by Nova Scotia craft beer enthusiasts who wanted to develop their own brew. Did you know? The name is a tribute to an ancient practice of hospitality and generosity in Medieval Times where travellers, or ‘wayfarers’, would stop and knock at churches and be given a small glass of ale and a piece of bread to refresh and help them along their journey. We got to try four of their beers: Hellene, Thistle Drew, Ruby Ale and The One-Eyed River Hog. I liked the Hellene the most since I prefer the light, less bitter, beers. Beside Wayfarer’s Ale Society is our last stop, Barrelling Tide Distillery, owned by Russell Murphy and wife Colleen. They are a grain-to-glass distillery which means everything is done on-site. 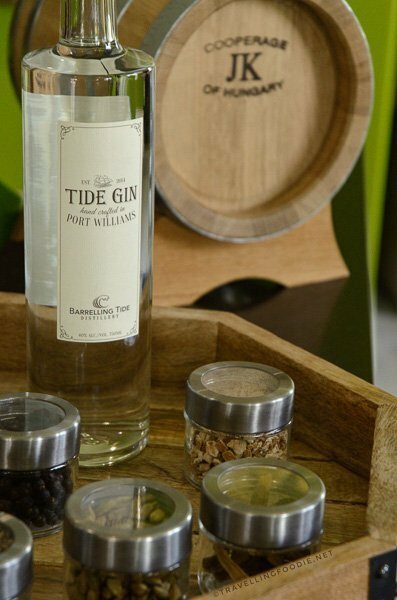 The Tide Gin is their most popular product because it’s not as “piney” as the typical gin. They also offer flavoured liqueur from simple Raspberry Liqueur, to uncommon Haskap Liqueur, to unique Chili Pepper Vodka. We got a tour of their facility and learned that they distill all their products in small batches so they can closely monitor the quality. They also mill their own grains. And if you are not drunk or tipsy from the tour yet, this one should by the cherry on top as you’ll get to sample 10 of their liqueurs. 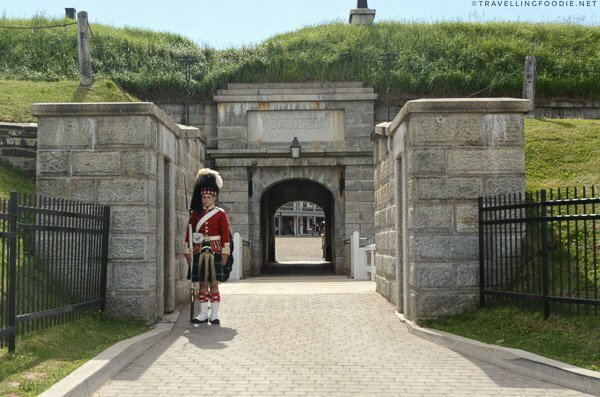 The Halifax Citadel National Historic Site is one of Canada’s most visited National Historic Sites. 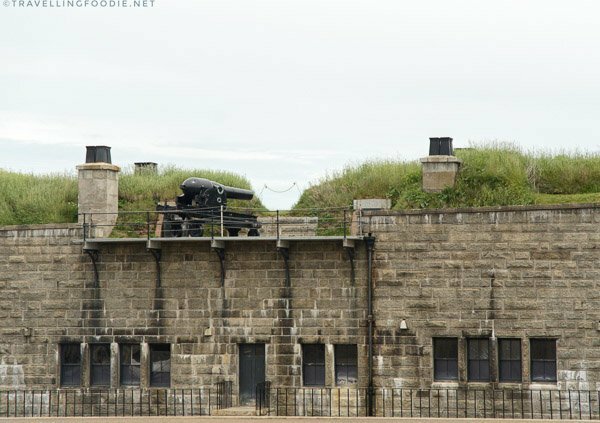 The Citadel, created in 1856, is fourth among the series of forts created since 1749 as a military fort occupied by the British Army until 1906 and by Canadian forces during the world wards. 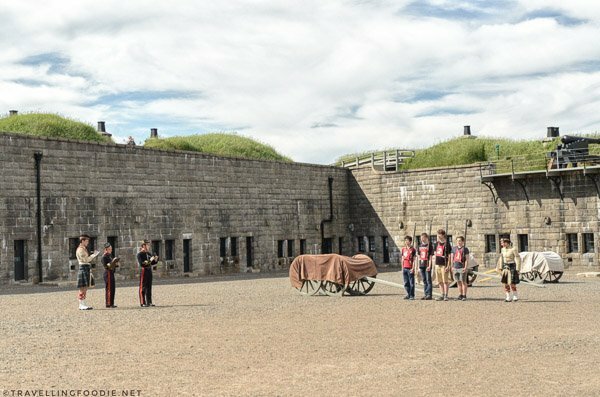 What’s great about this site is features a living history, similar to Fort Henry in Kingston, where you’ll get to see people in costume doing some of the rituals in the time period. One of the rituals is the firing of the Noon Gun. You’ll find one of the world’s oldest noon-day cannons here. And every day except Christmas, at noon, they would fire a reproduction 1809 12 pounder cannon. I’m so sad I didn’t get to witness this. Travelling Foodie Tip: Join the guided tour as it is led by a very informative costumed staff. You get to learn things not found on the written labels, and see some things you wouldn’t in the self-guided tour. One cool thing I got to witness is the rifle firing demonstration. Not sure if there’s a set schedule when this happens, but this happened during our tour. 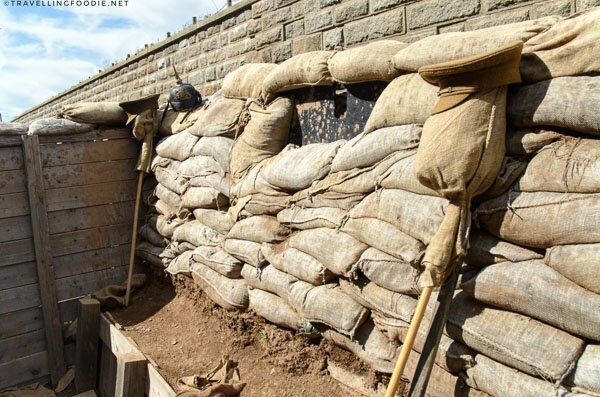 There’s also a special exhibit right now until 2018: World War I Trench Exhibit where you’ll get a sense of life in the trenches during the First World War. 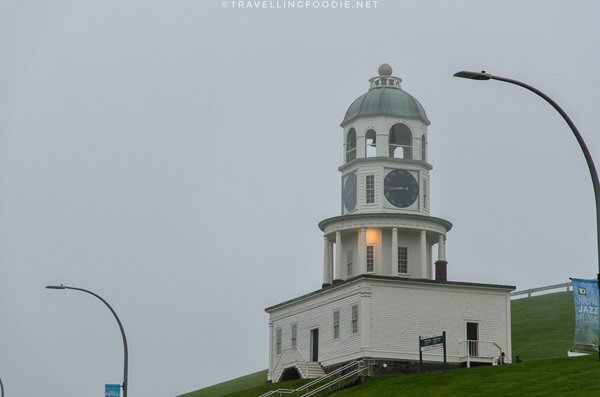 Just outside the entrance, at the base of Citadel Hill, is The Old Town Clock. 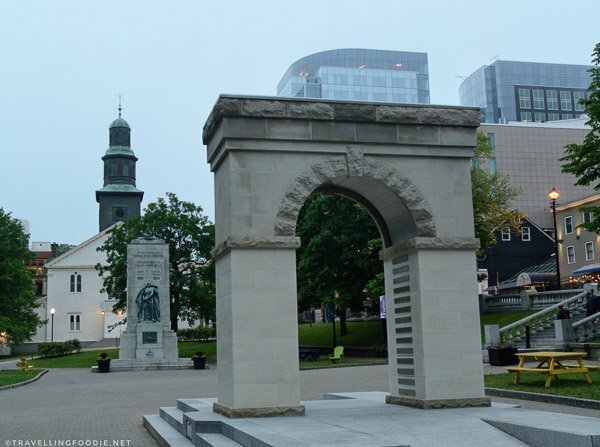 This historic landmark was installed in October 1803 as a parting gift to Halifax from Prince Edward, Duke of Kent, to ensure the city’s forces were always on time. 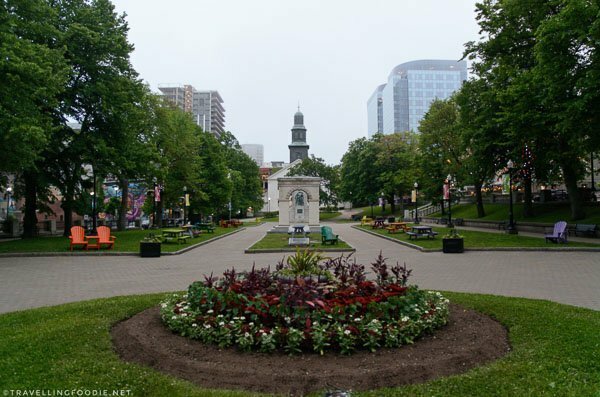 Valued as Halifax’s oldest area of public space and the heart of the city, the Grand Parade Square was established in 1749 as a square for military drills and parades. 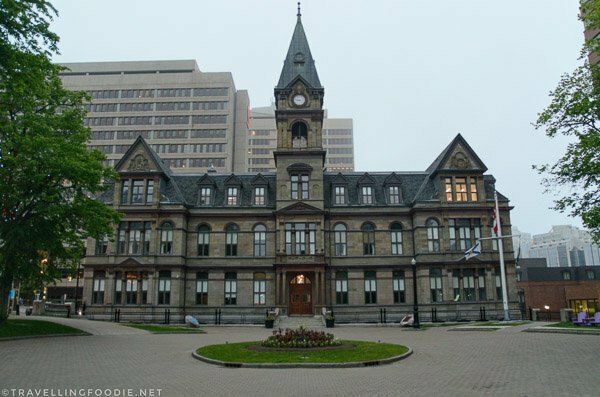 On the north end is the Halifax City Hall, a Victorian building that’s been on the Grand Parade square since 1888. On the south end is St. Paul’s Anglican Church and in the middle is a cenotaph, which was created to commemorate those who died in World War I. 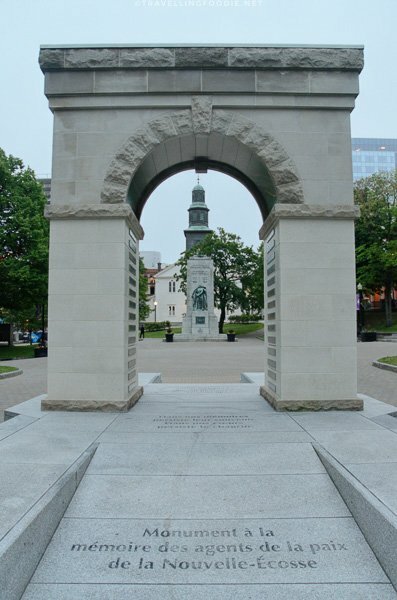 The concrete arch stands as a memorial of peace to officers killed in the line of duty. I love that they also put picnic benches and lawn chairs so that people can just relax and admire the square. 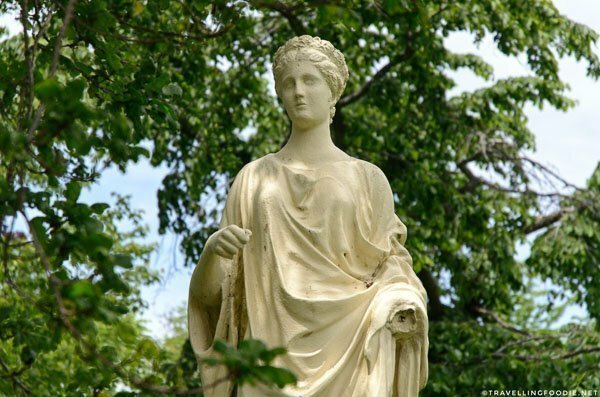 The Halifax Public Gardens opened in 1867 as one of North America’s finest formal Victorian gardens. 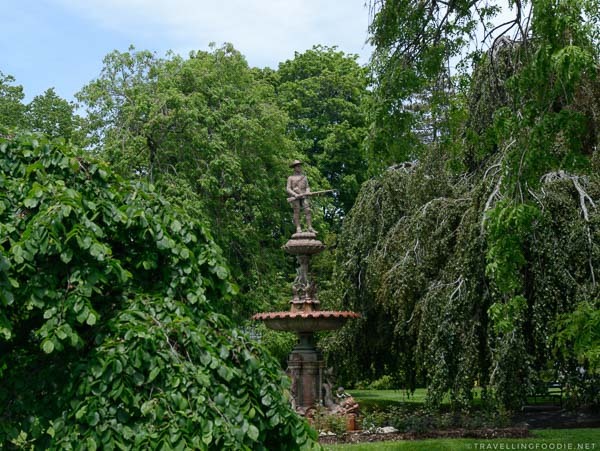 Enclosed by wrought-iron fence, this 17-acre garden features bridges, carpet beds (a Victorian garden tradition), tropical display bed, statues and urns, a bandstand and more. 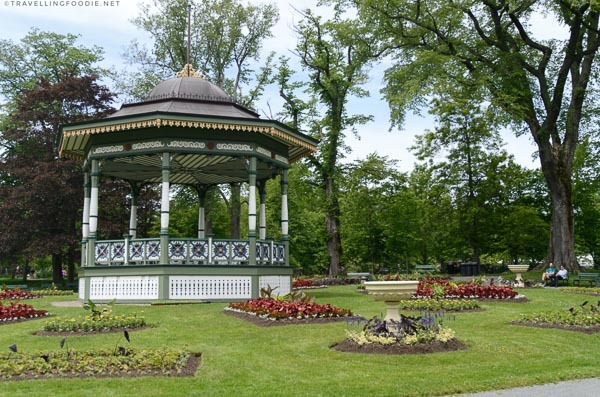 The bandstand is a venue for concerts and social events for over 125 years. 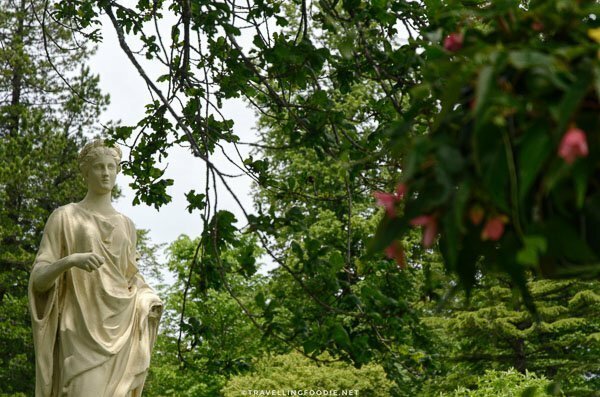 I love these kinds of gardens because it acts as an “escape from the city” in the city. Once you’re inside, you’re transported out of the urban life and into nature surroundings that makes you feel disconnected in the hustle and bustle of the city. Being a historic port city, Halifax has an amazing waterfront. The Halifax Waterfront stretches from the Canadian Museum of Immigration at Pier 21 all the way to the Historic Properties. Along the way, you’ll find the Halifax Seaport, the cultural district extending from Piers 19 to 23 includes the Halifax Farmers’ Market, a university, retailers, artisans and more. The cruise terminals are also here where cruise ships dock as I recall greatly from my cruise trip back in 2012. 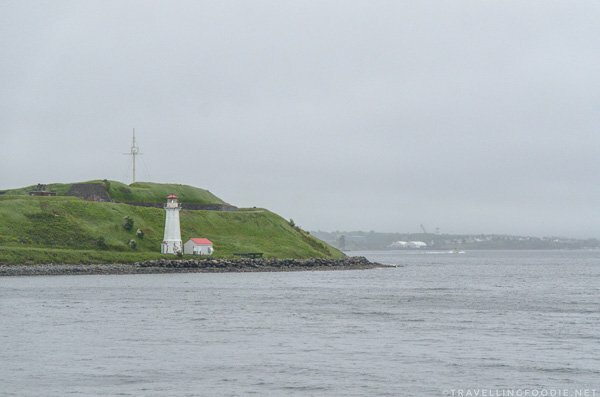 You’ll also find some of the places covered here by the waterfront like the Discovery Centre, the Maritime Museum of the Atlantic and Canadian Museum of Immigration. Near the Halifax Ferry Terminal lives Theodore Tugboat. 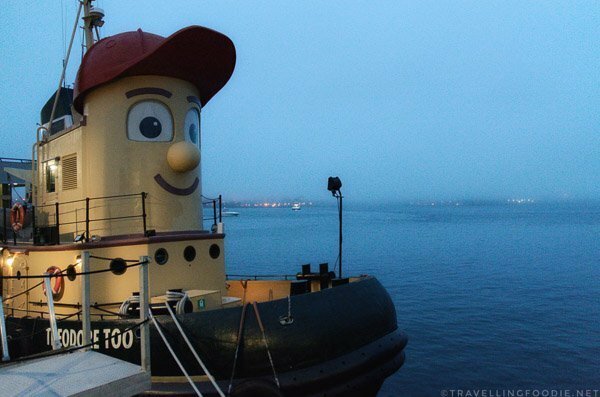 Based on the Canadian TV Show, the Theodore Tugboat’s Big Harbour Tour lets people, especially children, explore and discover the Big Harbour in an entertaining way with sights and sounds, sing-alongs to Theodore’s famous song, and meet-and-greets with other characters. One interesting I saw in the waterfront was this small boat being pulled by a ship. I initially thought the boat was broken and was being pulled out of the waters. But it seems like that’s just how it docks the boat as it sat there like that during the couple of times I strolled the waterfront. The Maritime Museum of the Atlantic is Canada’s largest and oldest maritime museum. This one museum packs a lot of marine history including the age of steamships, the Titanic, Shipwreck Treasures of Nova Scotia, the Halifax Explosion, and more. You can also find Canada’s longest-serving hydrographic vessel, the CSS Acadia, who’s over 100 years old and lives on the museum’s wharf. Travelling Foodie Tip: The museum is free on Tuesday nights from 5-8pm! 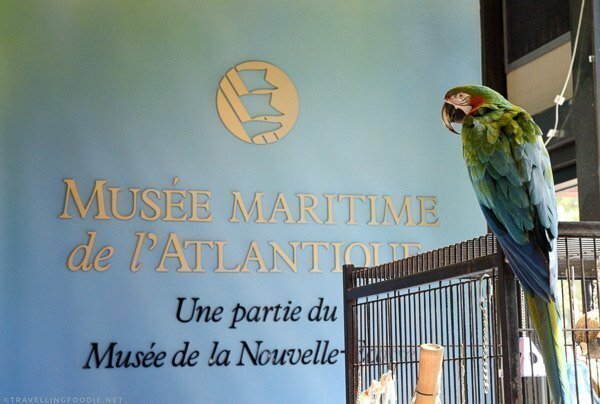 When you enter the museum, you’ll find Merlin, the cutest parrot ever. 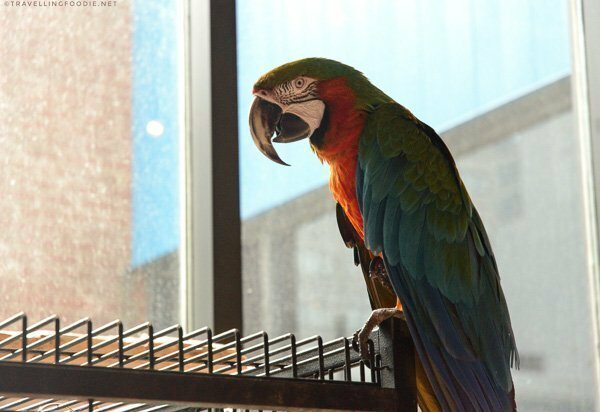 This Rainbow Macaw is a museum mascot and is so amusing to watch since he’s very talkative. Did you know? You can watch Merlin live via webcam here. 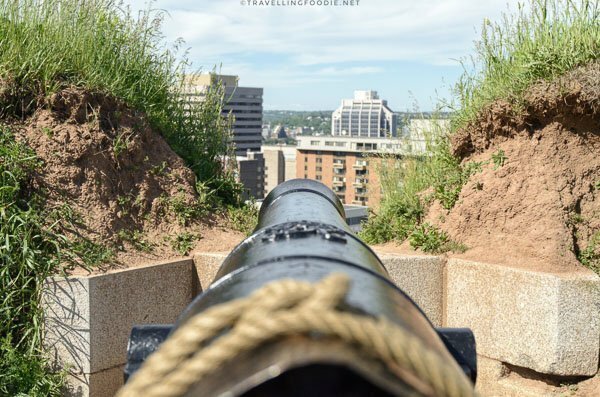 Posted on July 4, 2017 December 30, 2018 by Travelling FoodiePosted in Canada, Halifax, Nova Scotia, TravelTagged guides, nature, products, sights and landmarks, tours. I was getting a little anxious as I read numbers 1 through 9, wondering if the Maritime Museum of the Atlantic had made the list. But finally, there it was at no. 10 and I exhaled and smiled. 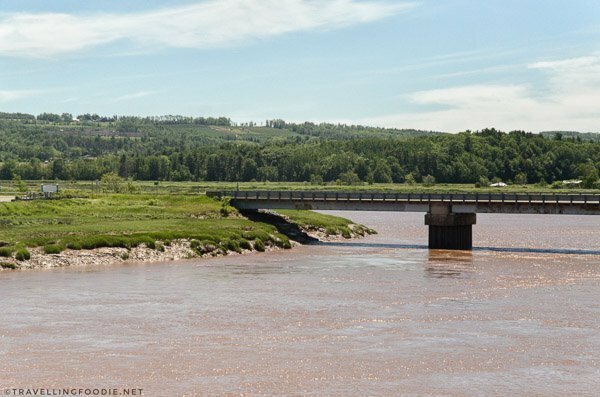 My fiancÃ© and I spent a day there during our Nova Scotia vacation, then we walked along the waterfront and finally, had a delicious dinner at McKelvieâ€™s delishes fishes dishes. It was my 3rd Nova Scotia vacation, but her first. While I brought her to my favorite places, I also wanted to see something new and the Maritime Museum was my destination. Now weâ€™ll have to come back and see nos. 1-9! Thanks for dropping by! So you and your fiance haven’t been to No. 1-9 together? Be sure to check out my article on Halifax restaurants as well. Curious to see which ones you’ve tried. I have ben there with Maltese TV crew some 15 years ago. We were doing a documentary about the Maltese in Canada. In Halifax there were quite a few. We even have a Maltese consul for Malta in Nova Scotia. Weâ€™ve been to almost all the places included here. Besides we have also had an intereting tour by land and sea on board the waterbus ( I forgot itâ€™s exact name) Infact it was the first time Iâ€™ve seen one. And we also were shown the lobster industry and savoured some very appetizing dishes with lobster. Our very professional guide, at that time Deanna Wilmhurst also took us to watch the most wonderful military tattoo in Halifax. Weâ€™re still friends. This documentary was shown on the Maltese state television station some few months after our visit way back in2001/2. Thanks for sharing! Love hearing stories from people who’ve been there! I think you’re referring to a duck tour? Have you been back since then? Yes you’re right. It’s the duck tour. And no I haven’t been there. I wish I would be able to come. This time with my husband. Im sure he’ll like it too. Please pass on our regards to Deanna Wilmhurst and her family. She was very helpful during our visit there. We are still very good facebook friends now.